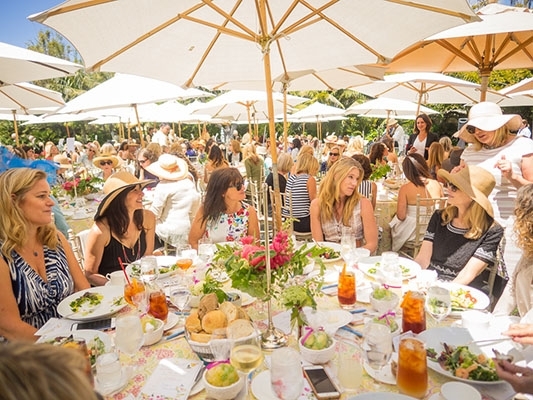 Angels Al Fresco Afternoon will be set in the beautiful gardens of the Four Seasons Biltmore Santa Barbara. Guests arrive early to purchase raffle tickets and browse a multitude of raffle prize choices. The luncheon is served “ Al Fresco”and the menu is a delicious array of European-inspired food from the Mediterranean. Beautiful table décor, music, floral arrangements and a raffle complete the event and make it a memorable afternoon honoring Angels Foster Care families. This year's luncheon is timed to coincide with Child Abuse Awareness Month in April and to serve as a lead into National Foster Care Month in May. Angels Foster Care of Santa Barbara is a non-profit organization dedicated to placing infants and toddlers in carefully screened, loving and dedicated foster homes. Since 2006, more than 250 abused, neglected or abandoned babies have been stabilized in loving Angels homes. Angels works year-round to advocate for our community's youngest foster children in order to ensure they have the brightest possible future. Santa Barbara Picnic Co. styles memorable moments and creates beautiful outdoor experiences. They engineer dreamy set-ups, and aspire to immerse you into a tranquil and inspiring space where you get the chance to relax, connect, and live in the moment. The picnic package is for a group of up to ten guests. Customize your experience with a mezze platter of your choice, macrame tent, rugs/blankets, cushions/pillows, small tabletop, fresh florals, and other decor. Choose your scenic location, such as Alice Keck Park, Mission Rose Garden, the Beach, or your own backyard! Wine courtesy of Frequency Wine Company. Experience the epitome of luxury and elegance with a one night stay and breakfast for two at Four Seasons Resort The Biltmore Santa Barbara. To round out your staycation, savor a delicious, Italian inspired meal and enjoy the stunning performances of world-class magicians. *Biltmore stay expires 04/30/2020. Accommodations include room & tax only. Breakfast through Room Service or The Bella Vista Restaurant. Valid Sunday-Thursday only, not valid in July and August. Only valid at Four Seasons Santa Barbara.